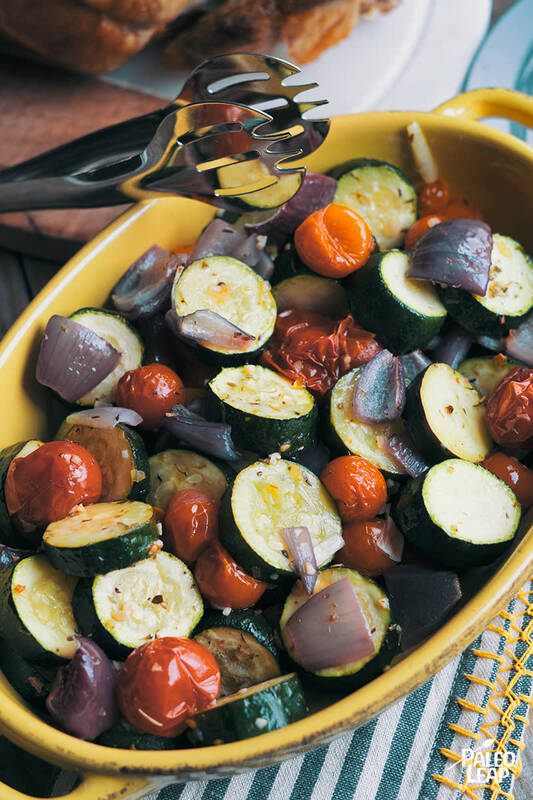 Roasted vegetables are the side dish to beat all sides. They are quick to prepare and you can serve them straight from the pan, clean up is easy as apple pie too (hint: you can bake these for a cheerful dessert, using the heat of the already hot oven). But, you have to eat your veggies first! That is always a good rule when it comes to eating for your health and well-being. Zucchini is one of those low-carb vegetables that everyone knows and loves. You can cook it on the savory (or sweet) side, alternatively one can consume it raw in salads too. One medium zucchini contains vitamin C, anti-inflammatory nutrients, and heart-healthy potassium so what’s not to adore in a humble vegetable? When zucchinis and tomatoes are in high season, we can imagine ourselves eating this dish often. It combines well with any form of protein, especially, though, we like it with a flavorful grilled spatchcock chicken. Or to keep in line with the Italian dinner theme, and to make meal prep as uncomplicated as possible, a slow cooker chicken cacciatore recipe certainly fits the bill. Roasted vegetables are a thing of the near future, are they included in your meal plan for the week? Add all ingredients to a large bowl, season to taste, and gently toss everything. Place the vegetables on a parchment lined baking sheet. Roast in the oven 25 to 30 minutes.